Displayed together in England for the first time in a century, these impressionist paintings cover equine subjects, portraiture and pastoral landscapes. They highlight the role of horses in military operations, capturing their beauty in the war-affected landscapes of France in 1918. The exhibition includes paintings on loan from the Canadian War Museum, as well as selected works from the National Army Museum’s own collection. 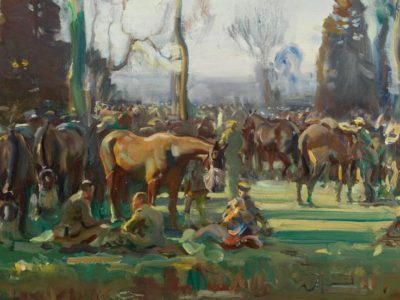 It has been developed by the Canadian War Museum (Ottawa, Canada), in partnership with The Munnings Art Museum (Dedham, UK) and generously supported by The Beaverbrook Canadian Foundation.